German philologist; born at Tütz, West Prussia, 1815; died in Berlin 1864. He studied at Berlin University, and received the honorary degree of Ph.D. from the University of Königsberg in 1854 for his profound knowledge of the Greek language. 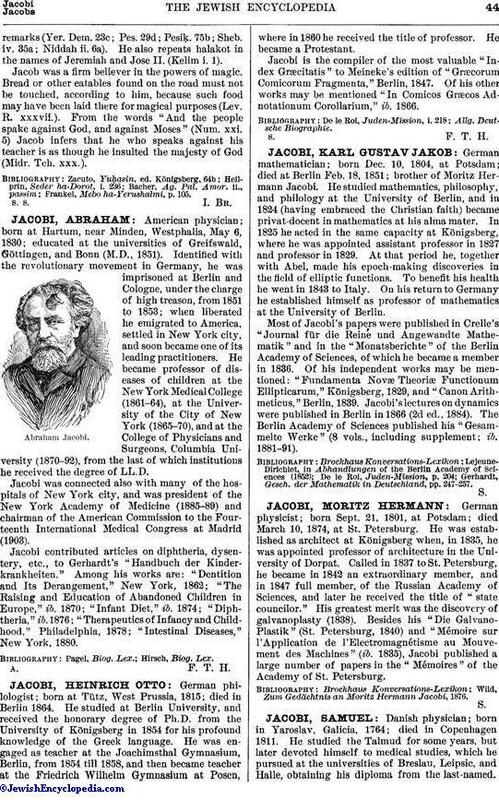 He was engaged as teacher at the Joachimsthal Gymnasium, Berlin, from 1854 till 1858, and then became teacher at the Friedrich Wilhelm Gymnasium at Posen, where in 1860 he received the title of professor. He became a Protestant. Jacobi is the compiler of the most valuable "Index Græcitatis" to Meineke's edition of "Græcorum Comicorum Fragmenta," Berlin, 1847. Of his other works may be mentioned "In Comicos Græcos Adnotationum Corollarium," ib. 1866.